Uncertainty until the end. The weather forecast is not good. Besides, these forescasts are no longer reliable. The abundant snowfalls in the last days are doing harder this adventure. 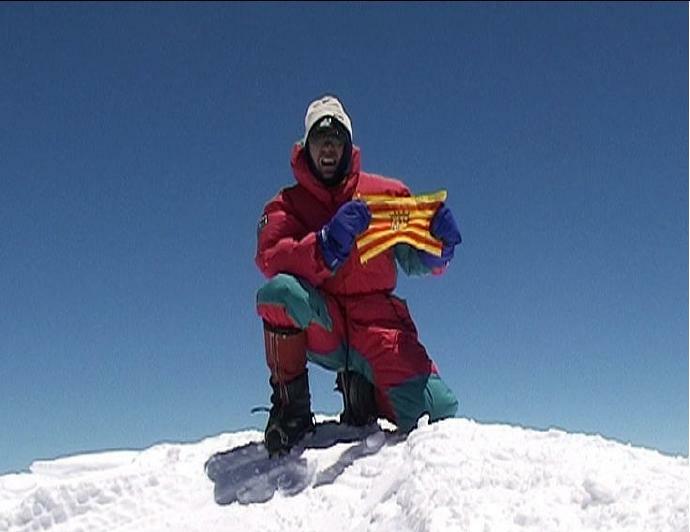 The Raulés and Adrián have not finished the task on this mountain. They have to descend in very sensitive circumstances. Snowfalls have erased the footprint, surely there will be snow covered the material left in the CIII, (sleds, skis, rubbish and some food). Raúl informed us that they are going to descend roped, they are going to join to two austrian to configure a strong rope, a strong group of five people who can work together and ensure the descent utmost. When they arrive at CIII, they have the arduous task of shoveling and bringing their goods out into the light. From this point, they will have to analyse again the descent until the CII or CI. The Austrian people do not go with skis, so it could delay our climbers. But if conditions are not favourable, they will have to analyse the situation and take a decision. News are not encouraging, yestarday a group of climbers fell into a snow covered crack, fortunately there is only one person with several broken ribs and the others have suffered some injuries which have to be seen by a Doctor. The cracks which had to be avoided along the ascent, were discovered and were evident, these cracks have now become death traps. The climbers know of their existence, but they do not know where exactly they are, maybe some of them can be guessed but others not. Apart from this, this route has to be done in the middle of a snowstorm, opening footpring, sinking in the snow to who knows where. This mountain is very hard, but the reward, the real summit, is in Talkeetna and until then they can not relax. The Denali have put them to the test until the end and, day to day, they are overcoming it. Their intentions are clear, they want to descend and descend and contiue descending if possible, without a defined destiny, (CIII, CII, CI), when they decide to stop to sleep, they will inform us of their situation, sorrows and plans. They are cheerful, but cautiously. At 16:35 h (Alaska), Adrián Uclés and Raúl Martínez have arrived at CIV where they have met Raúl Ruiz. All three are in perfect conditions. Now the descent left, but before descending they have to organize loads and rest. Words full of emotion and panting, articulated by Raúl Martínez, extremely weary because of the great effort done by Adrián Uclés and him, to reach the Denali summit, 6194 m.
Managing to arrive there has not been an easy task, trainings, seeking for sponsors who believe in the project, in a moment so bad as this, charges, purchases… To fly to Anchorage, travel by bus to Talkeetna, another flight to Kahiltna (2.225 m), carrying 50 kgs. by mountain sled until Ski Hill (2.408 m.), besides, to drag the sleds towards Kahiltna Pass (3.048 m), then, Motorcycle Hill (3.353 m), and above Basin Camp o Medical Camp (4.328 m), carryings to Ridge Camp (4.938 m). And finally… the crucial days. The Raúles and Adrián, went decisively towards the CV, convinced that it was one of the best moments, the weather predicted for middle of this week and they had to be there, ready, to devote themselves entirely. But ….the team began to suffer, they were debilitated. When they arrived at the ridge, Raúl Ruiz, decided to give it up, he was very tired and he could not bear anymore, he was aware that still the descent left and his condition was not good to be able to continue. Raúl R., arrived at the point where he had to decide if going up or going down. He thought that going up could result in being a burden for the team. This thought was decisive and he went down to the CIV without delay. Mountain history is full of gestures like that. Men who, without selfishness nor laureles, decide to return. A wise decision which praises the person who takes the decision. His work has been really important for this adventure. Adrián Uclés and Raúl Martínez, after giving him a sympathetic wink, left him behind, with the intent to inforce their effort and to arrive above. They slept in the CV and began their way towards the summit, their steps were slow and awkward, but firm. One after another, walking slowly, without talking, a silence interrupted by the crampons noise wrecking the ice. And after eight hours of sorrows, at 18:30 h, they arrived at the highest point in North America, the coveted Denali summit. They melt into his embrace, they were overwhelmed with emotion and their faces lit with a unequal smile, a great part of their thoughts was focused in the CV, which they completed in three hours. In this fateful place, they have got in touch with us to share their happiness and their achievement with us. Now the climbing with the fixed ropes left and at the end of the ropes is waiting Raúl in the CIV. Another unique moment, moment in which they will enjoy the authentic summit, the return. A well known climber said, -a triply successful expedition, they all are back, healthy and more friends …..
We will inform you as soon they arrive at CIV. At his moment, we have not got any news from our climbers. 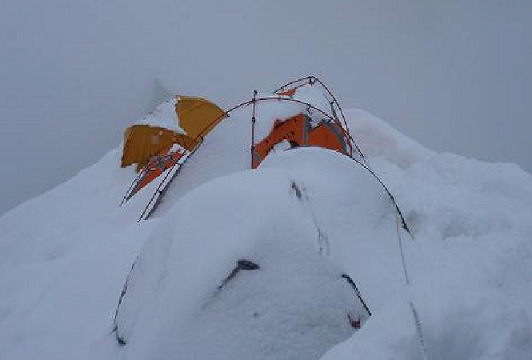 Now, they are problably sleeping in some height camp or walking towards the summit. We hope to receive news from them along the day. We will inform you as soon as it happens. We think they are close to the ending, perhaps a few hours, maybe one day, could distance us from having good new from of our climbers. They have ascended route to CV, thay have overcomed again the fixed ropes. They will face the West Buttress, the ridge which gives its name to the path. This ridge is very dangerous although there are anchorages and fixed ropes along all the route that secure the progression. 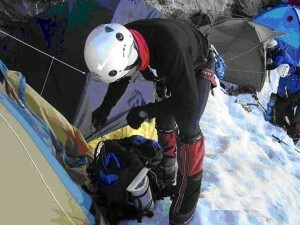 The biggest difficulty is the strong wind, so the ascent over the ridge is a delicate moment. Day is not too favourable, but to attempt to reach the summit they must go gout now, without delay. It is likely to be steady on tuesday or Wednesday, according weather forecast. Adrian has a double fight, the Denali challenge and his backache. He wants to fight to the limit. The Raules are tired but better than Adrián. The load distribution has been proportional to the current strength of each one. This helps them to arrive to the highest point. They are fighting tooth and nail, their voices seems to be getting fainter and fainter, but they trasmit us calm. Communications are not good, talks are slow, the reflections are with long silences. We expect moments of uncertainty, diffused moments. They know we are following from here all of their movements, we are encouraging them and it is a great support for them. We hope commications get better, but now it is necessary to ration the satellite battery, communicate one instant and make the most of it, beasides, the orography os this mountain creates shadows that make the transmission difficult, therefore, we will continue informing you as soon as we have news. Today is a day of relative rest, it is not possible to rest totally at the mountain´s altitude. That means one day of inactivity. We rested our crippled bodies on a comfortable feather sack which isolates us from the land. We three are into a small tent in which we have to ask for permission to move. It is snowing outside and it is a little windy, a gusting wind which moves our fragile home. The silence dominates the situation, we have talked about everything, we have told us all things. The wet deck, has done its task for a moment. Time passes slowly here. We sleep, make water, go out to stretch our legs a few minutes, and like this, several times. We wait for the lunchtime, and then, dinnertime. We opened the zipper of our hideout and we stuck our heads out of there to look the route again. We are calm, we know that our task is done. Now we are almost finished, we have to pass the final exam, we will review mentally, in silence, the ascend route. Our thought is focused on the edge. We must be cauitous, walk slowly and firmly, we are hoping for a cold and a calm day, not windy. We want to advance with suffer, but go advancing. We desire to reach the summit in a moment of clarity, in a moment in which we can see the infinite and we three can give us a big hug, with a smile from ear to ear and that we can communicate with our families and friends by satellite phone in order to share our happiness. 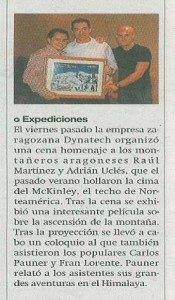 We hope we can thank to all people who has helped us and specially to Dynatech-elevation, its support. Today the opposing remark is the bad weather. They have arrived until 5100 m and an unexpected snowfall has blocked his way. Besides, Adrián is suffering from a backache now, probably caused by the effort of dragging the mountain sled on the previous days. Adrián did not give it importance – “one day to rest will be probably the best cure”. Before descending they have left one depot, during descending, the snow and the bad visibility have been the constant, guided by the fixed ropes, they have carried out the descent until arriving at the heat of the CIV. This heat is curious…. The CIV to 4328 m. snow-covered, to foor days from civilization, it becomes our home. A place in which we feel protected. A place where after the effort, you can rest, relax, reflect and recover. But in the middle of these pittances and poverties, there is always something positive, something that raises the morale. They have met an old friend, the Ecuadorean Iván Vallejo who was descending from the summit. Small Iván for his friends, he is a mathematics professor, he has become a climber. We met him once in Nanga Parbat, Pakistán, we has working for the TVE program “Al filo de lo imposible”. We suffered much on this mountiain, but we enjoyed a lot, we had a good relationship, he visited us last year and we stayed in Zaragoza for a few days. Iván greeted them without recognizing them but a familiar voice awoke them from the lethargy that the altitude gives to Raúl. When they recognised they embraced each other. Raúl e Iván carried on their route whit a smile, that for a moment, evaded them from the Denali mountainside. The weather forecast is not good and they plan to rest. In the meantime, they will hope that the snow settles over the mountain and Adrian gets better soon. The communications from here are not good, there are shades which do not allow a favourable coverage. The climbers want to get acclimation through the carryings, they desire to arrive in CV Ridge Camp (4.938 m.). During the route to this camp, they will ascend slopes of 45-60 degrees, and they will begin the 250 m. of fixed ropes that precede the hill. They are aware that the progression will not be the same as before. Raúl Martínez pointed out that the edge was dangerous because of the wind , and if just the slightest thing would happen, they would leave a depot and would go down, anyway they would try to arrive at the nearest place from the corridor and therefore they would face the fixed ropes lightly in the next attack. They are tired, several days of accumulated effort and life in dire circumstances have passed. The inappetence at the heights is a factor against which they must fight. Another hard work is making water, they have to make it by melting snow, it is recommended to drink 4 liters per person. They have to sleep over a snow-covered surface, so in spite of having a good equipment, they can not sleep well. It is a gradual physical and psychic exhaustion, another obstacle to face and overcome. The weather forecast is not clear, it is likely it gets better next tuesday night, but it must be checked with the Rangers forecast. When Raúl inform me about his state of mind, the communications cut off at all. We hope the communications will be better tomorrow.